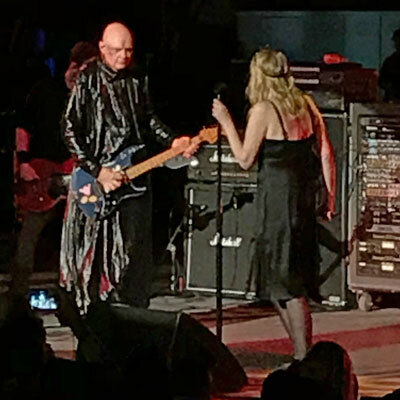 The Smashing Pumpkins performed their highly anticipated 30th Anniversary show on August 2nd at PNC Bank Arts Center. 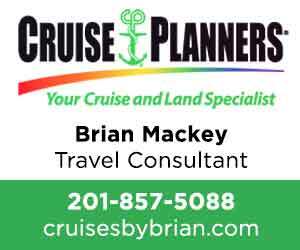 The Shiny And Oh So Bright Tour provided New Jersey fans with a surreal experience, to the extent that attendees left disappointed the evening was not filmed for the rest of the world to witness. 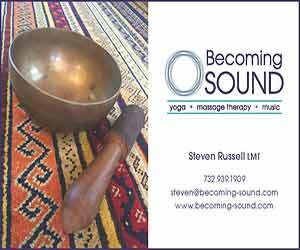 The tracks that the Smashing Pumpkins performed ‘solo,’ ala without any of the entourage of guests who made appearances throughout the evening, were isolated almost exclusively to hits and cult classics. Rather than kicking off the show with “Mellon Collie and the Infinite Sadness” and “Disarm,” as with all other shows, the Pumpkins gave the fans what they wanted by opening up the Holmdel show with “Rocket” (Siamese Dream) and “Siva” (Gish). The first special guest of the evening was Chino Moreno of Deftones, who joined the Smashing Pumpkins to perform “Bodies” and “Snail.” Thereafter, the Pumpkins performed the second solo highlight of the evening, lighting up the crowd with the fan favorite “Tonight, Tonight” (Mellon Collie and the Infinite Sadness). Almost to be expected, Billy Corgan began receiving criticism before the tour even kicked off for the absence of former bandmate D’arcy Wretzky, who is said to have declined every offer to be a part of the reunion tour. Yet, by the time the band played “Tonight, Tonight,” it became evident that the only person who was missing out was D’arcy herself. 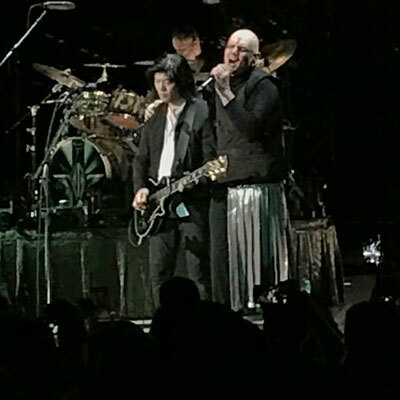 Billy Corgan, James Iha, Jimmy Chambers and Jeff Schroeder carry the Shiny And Oh So Bright Tour immaculately as a unit. The climax of the show came when Billy Corgan welcomed the most controversial guest of the evening. “One of my favorite people in the world,” he said. “We made love, we’ve not made love. We’ve made up, we’ve broken up. But we’re back together again, my dearest friend, Miss Courtney Love.” Despite the tumultuous history the two share, when Love came on stage she was unfiltered as ever while still showing her love for Corgan, “Nemesis, best friend, lover… and what a lover… worst friend, protector, career maker… I love this man with all my soul. 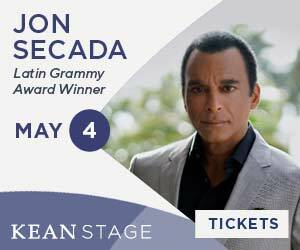 He co-wrote the songs which keep me sustained. So let’s go mother fuckers!” This was a true rock and roll moment. The cheering from the crowd was as loud as ever when the Smashing Pumpkins and Courtney Love performed Hole’s breakout 1998 hit and lone number one single, “Celebrity Skin.” Corgan and Love both co-wrote it. The iconic moments continued with the performance of “Malibu,” and lastly “Bullet with Butterfly Wings” (Mellon Collie and the Infinite Sadness) with Love staying on stage. It was clear it was time for her to exit as the substances were starting to take effect. Courtney Love was necessary for this monumental show. Pete Hook joined the Pumpkins on stage for a slew of covers including New Order’s “Age of Consent,” “Joy Division’s “Transmission,” and an ensemble cover of Joy Division’s “Love Will Tear Us Apart.” The last included AFI’s Davey Havok and a lovingly disruptive Courtney Love encore. 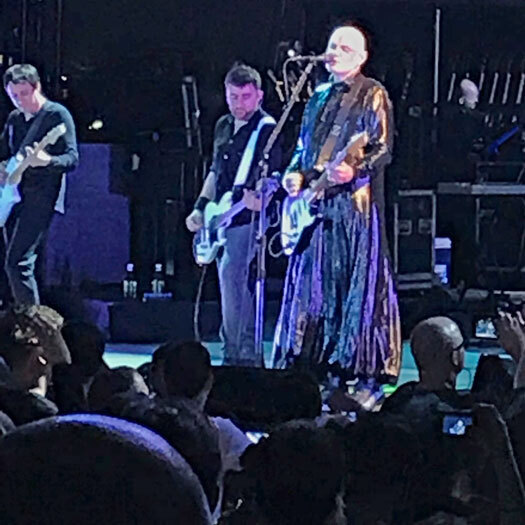 The Smashing Pumpkins wrapped up the show on a high note with the band’s new summer single “Solara.” They followed with an intimate cover of Betty Noyes’ “Baby Mine,” which was met with a standing ovation and ongoing applause. 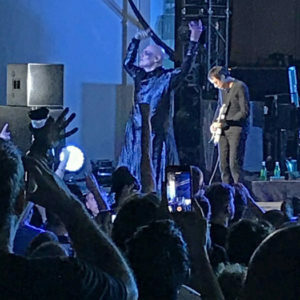 This was a one-of-a-kind evening satisfying the fans and letting it be known that the Smashing Pumpkins are back, and quite possibly, at their best yet, with or without D’arcy. The only shortfall may have been the absence of Adore tracks, by the far the band’s most underrated album and most vulnerable to date. It would not have fit with the 30th Anniversary show. Fortunately, fans will get to experience Adore and every component of the Smashing Pumpkins’ career on the remainder of the Shiny And Oh So Bright Tour. The Smashing Pumpkins: Shiny And Oh So Bright Tour tickets are available at SmashingPumpkins.com or Ticketmaster.